System designer Amit Peleg is the owner of Peltrix, an audio, video and AV design/consulting/installation company based in Purdys, NY. He details his involvement at a recent audio system upgrade to Sony Hall in New York City. 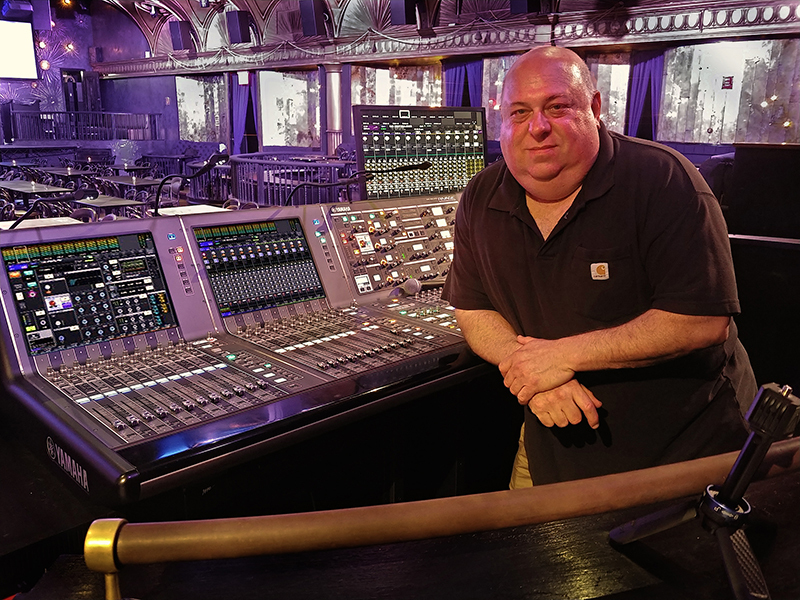 Sony Hall, a new music venue in the heart of New York’s theater district, is making use of the first use of three of the latest live sound technologies: d&b audiotechnik Soundscape, Sony’s upcoming immersive sound and Yamaha’s Rivage PM7 mixing console. Located in the renovated historical Diamond Horseshoe (at the Paramount Hotel), Sony Hall presents world-renowned performers across all music genres. Owned and operated by Blue Note Entertainment Group and sponsored by Sony Corporation, Sony Hall is a full service restaurant and bar with capacities of 1,000 standing and 500 seated. Much of the classic look of the Diamond Horseshoe was preserved while the room was fitted with state-of-the-art technologies. Early on during the design phase, it became apparent that we had a unique opportunity to do something special with this venue. Sony requested that Peltrix fit the room with a speaker configuration that can showcase its up-and-coming immersive technology for pre-recorded content. 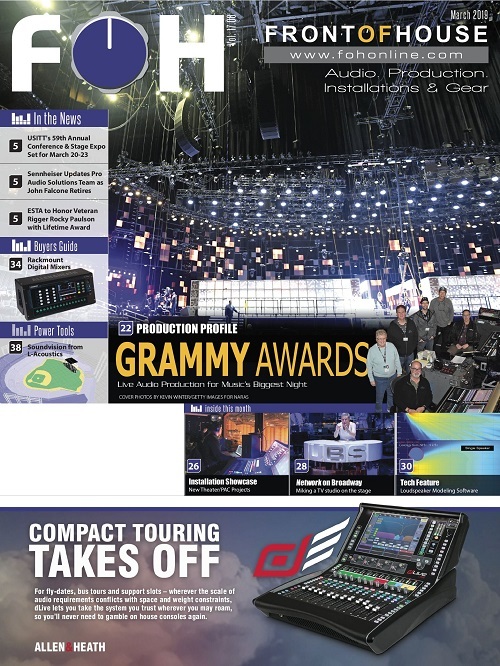 At the same time, d&b audiotechnik was about to release Soundscape, its highly anticipated object-based positioning hardware/software solution for mixing live sound. 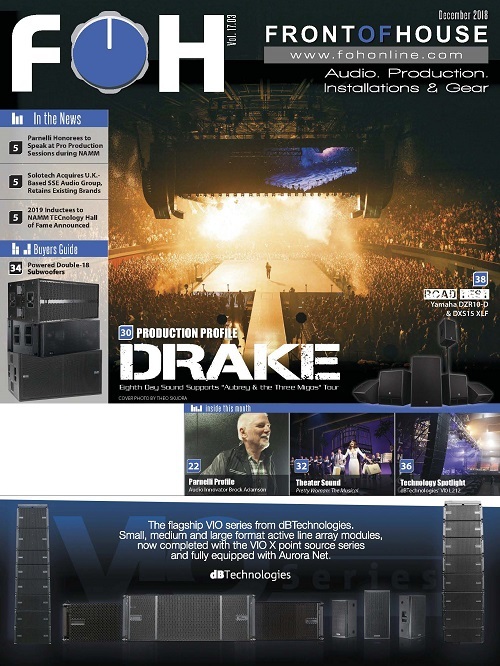 It was determined that it would be beneficial for both live performances and the showcasing of Sony’s new technology if Peltrix integrated a new audio system that would benefit both applications. 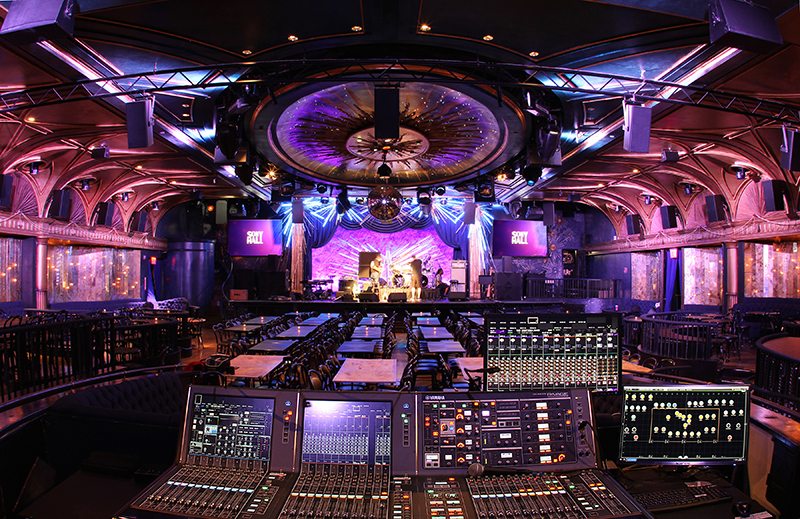 The project brought d&b’s Soundscape to the former Diamond Horseshoe venue. While having some concerns over being the pioneers with the use of the new Soundscape technology, Sony’s requirement for 30 speakers (excluding subs) to showcase their immersive technology made it easier to go in the direction of Soundscape for the live sound application. Fourteen additional speakers were needed for a Soundscape configuration, just three more speakers than a conventional Left/Right/Center (LCR) configuration would require. Although we designed the system so it can operate in a conventional L-C-R mode, running it in Soundscape mode offered the added features of object-based mixing with En-Scene, and acoustical room emulation with En-Space, both running on d&b’s DS100 signal engine. Mixing on a Soundscape system with En-Scene requires a different approach and thinking than a conventional LCR system. The En-Scene tool lets you position and move up to 64 sound objects in space. Soundscape does all the calculations of levels and delays between the speakers. When mixing, you not only have to think about making a channel, group or effect sound good, but you also need to decide where you want to “put” it. You no longer mix to speakers, you mix to location. Position mixing solves the age-old psychoacoustic enigma. You can position an instrument in space to match its physical location on stage, thereby alleviating fatigue caused by a disconnect between the visual and audible senses. It also lets users position objects to create an immersive experience. Imagine a piano captured with multiple microphones, with its objects positioned around the audience. It would be as if each audience member was sitting inside the piano. Another example? Imagine a band playing a tune, and as the drummer takes a solo, you move the entire drum kit to the center of the room. What an effect! The options are endless. While mixing to location, why not match the acoustical characteristics of the room to the type of music being played? That’s where Soundscape’s En-Space comes in. En-Space lets the engineer employ emulation of different room acoustic signatures. It’s not just a reverberation effect being played through speakers, it is an emulation being played though all the channels, using Soundscape’s positioning and delay capabilities. The Sony Hall’s Soundscape system consists of five front speakers spaced equally across the stage, five matching delay speakers further back in the room, seven speakers on each side of the room, four speakers in the rear firing inwards, 12 overhead speakers, two corner fills, and six subs, four of them in regular mode and two in infra mode. One of our early concerns was related to production. As this is new technology that most engineers are unfamiliar with, we anticipated some challenges in getting guest engineers up and running with the system in the short time normally available before sound check. After all, it takes some getting used to and a change of approach if you were to take full advantage of the system capabilities. A game plan was put in place in conjunction with the house production staff to do as much preparation with guest engineers during the show’s “advance” phase. The sound crew also created a base structure that provided a very quick patching scheme that gets guest engineers up and running in a matter of minutes. And should a guest engineer prefer not to use Soundscape, an optional LCR mode is always available, bypassing the Soundscape engine and passing the signal through a BSS London DSP. Yamaha’s new PM7 within the venue. 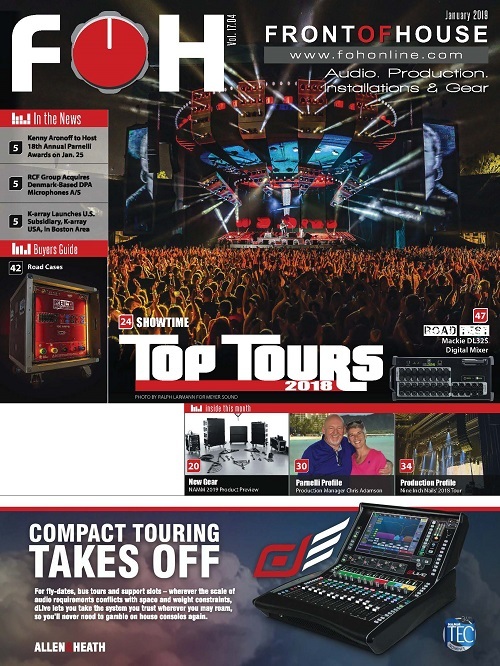 design, Yamaha was about to release their new PM7 console, capable of providing 60 buses and 144 Dante channels for each Dante expansion HY card. For this project, we took delivery of the first two Rivage PM7 consoles out of production. The PM7’s configuration allows us to provide all the required objects for Soundscape, multitrack recording capability of up to 64 tracks and run monitors from FOH in case there was a requirement for bypassing the monitor PM7 console. Additionally, as the PM7 runs 96k Hz natively, it satisfied Sony’s requirement of a 96k sound system to showcase its immersive technology. To support the audio capabilities of Soundscape, an exceptionally good sounding console was required. For that we chose to go with the optional RPio622 stage box with Rupert Neve Design’s SILK analog input cards. The PM7 console has some great features that made the choice to go with this model easy for this venue. For example, multiple engineers can work on a single control surface, either the FOH or Monitor console to create separate mixes not only for the mains and monitors, but separate mixes for recording, live streaming, press, etc. Each console can be divided to act as multiple separate consoles with the engineers not interfering with each other, working completely independently. Ease of use was another important factor in the console selection. Sony Hall is the type of venue that gets a different guest engineer almost every night, so it’s imperative that the house consoles be easy for anyone to walk up to and start using right away. The familiar interface of Yamaha is that common denominator that almost every engineer is familiar with. 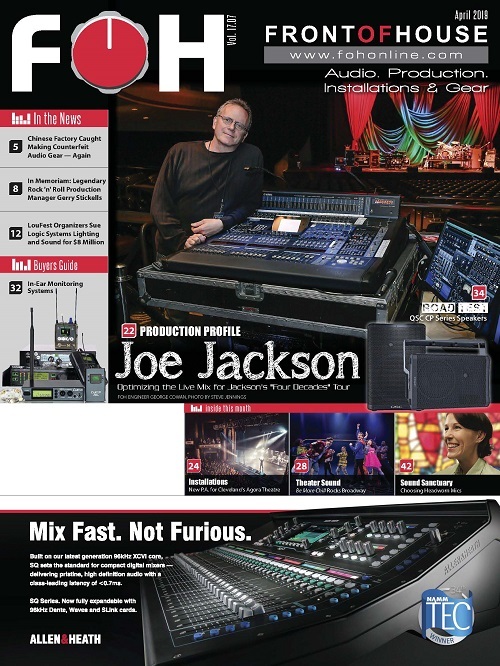 While the PM7 certainly has countless features beyond lower models, anybody who’s worked on Yamaha’s CL, QL or M7CL can find their way around this console and get started quickly. 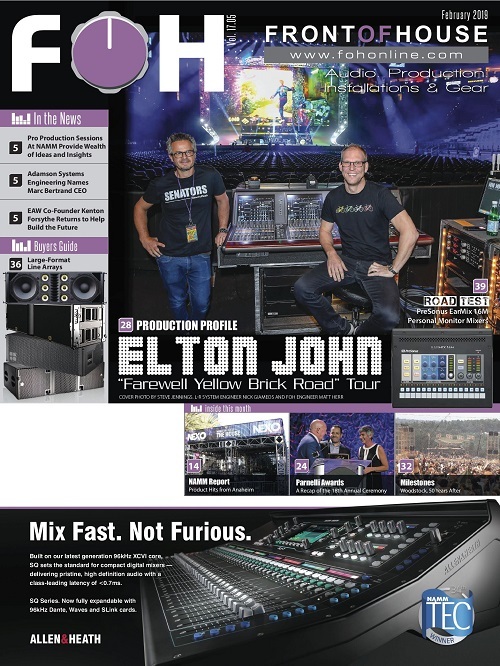 As Sony Hall hosts not only live music but corporate events as well, the built-in Dan Dugan Automixer comes in handy as an indispensable tool. As a design/install firm, the most important “feature” for us is reliability and support. As Peltrix specifies the equipment to be purchased by our clients, an unreliable product would reflect badly on us. From 35 years of experience in the field, we never have to worry about that with Yamaha products. And should something will go wrong, they are always there to rectify it immediately. Sony Hall is a Sony venue. So it’s no surprise that they want to showcase their newest technology at their venue. To facilitate that requirement, an “immersive” configuration of speakers were installed. The “Sony Mode” utilizes two front speakers, 14 side speakers, four rear speakers, six overhead speakers, and six subwoofers. Signal distribution is via Dante. Much of this technology is still a secret, but if you come to hear a show at the venue you are treated to a breathtaking demonstration of its capability before each show. With flexibility comes complexity. There are four possible modes of operation in the Sony Hall system: Soundscape, LCR, Sony and DJ. To facilitate the four modes of operation, a Dante network was used throughout. Up and Down sampling rate conversion was utilized to accommodate some of the features that did not support 96k natively. A complex setup of DSPs was used to facilitate 60 inputs from Soundscape, four inputs from LCR, 32 inputs from Sony and three inputs for DJ events. That’s 99 DSP inputs, which are distributed not only to the 48 main room speakers but also to other locations in the venue such as a lounge, retail space, etc. Some modes require no delay settings such as Soundscape, which does its own delays, while other modes require EQ, delays, auto-level and other dynamic processing. While a lot is happening behind the scenes in the three BSS BLU-106 DSPs, to the operator it culminates in a 4-button touch panel where they can simply select the desired mode of operation. Every installation has its challenges and difficulties and Sony Hall was no different. The schedule was beyond tight. We had 40 days to complete the job, from the design phase to the first show that was already booked. We had to get creative with fulfillment of some of the d&b equipment, as we had it trickle in as we worked on the installation. Extra pressure was put on delivery time for the first PM7 consoles as the exact availability date was yet unknown. The tight schedule applied not only to Peltrix but to the other trades working on the construction, which made the installation that much harder with schedule coordination. The biggest technical challenge was hanging the 12 overhead speakers. The existing drop ceiling in the space was made of custom molded fiberglass composite and was hand-painted throughout. We had no idea what is above it and what’s up there to support speaker mounting. If we were to make openings we wouldn’t know if it would fall under HVAC duct, electrical conduit, plumbing pipes or any other structural obstruction. Removing large chunks of the drop ceiling was out of the question because it would take weeks for repairs and repainting by the artist to restore the hand-painted look. To complicate matters further, exact placement of the speakers is crucial for Soundscape’s EnSpace to perform to its full potential. We had no play with the location of the speakers. At the end we made small openings that were coordinated with the paint artist. We had to be very creative with creation of mounting points and essentially had to fashion a unique, custom rigging solution for each and every speaker location. 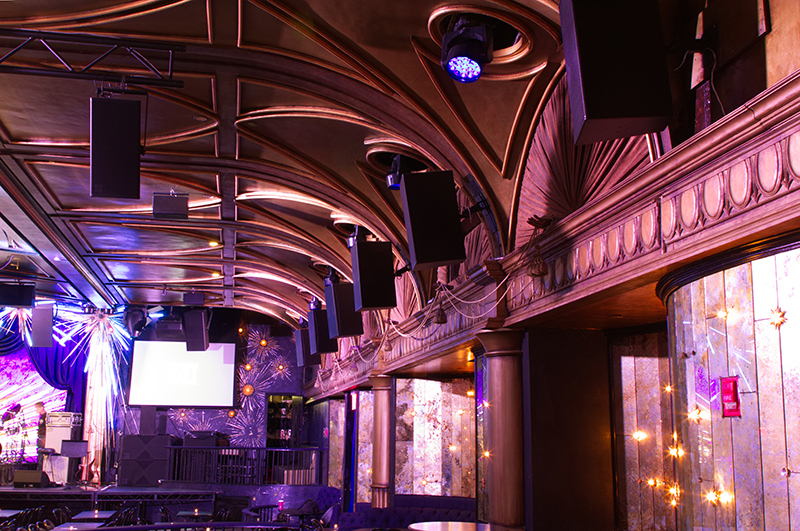 As we were about to complete the install, d&b Audiotechnik surprised us by sending its Soundscape expert Felix Einsiedel to participate in the commissioning of this first-ever Soundscape installation. Felix spent ten days with us, which helped immensely. The time we spent together not only helped us, but it also revealed a few real-world quirks in the system that were addressed by d&b immediately — not too shabby for customer support. Sony Hall is a great new venue in a prime location that now offer a new set of technologies making it a unique venue in which to perform — or attend — a show. This installation wasn’t easy but we prevailed while learning a lot about Soundscape at the same time. Peltrix is now well-positioned to facilitate the use of the new position-based mixing technology in future installations. System designer Amit Peleg is the owner of Peltrix (www.peltrix.com).